The price of gold is impacted by how the stock market and U.S. dollar are performing. And these days, the market looks shaky. The overall stock market has become way overvalued, with an average price-to-earnings ratio (P/E) of 23, meaning investors are currently paying about $23 for every dollar of annual earnings of the underlying companies. There’s no reason for that sort of overpayment for earnings right now. Earnings are actually decelerating, thanks to a previous rally in the U.S. dollar that hurt multinationals when converting overseas earnings from foreign currencies back to their dollar-denominated books. So stocks are overvalued and company earnings are slowing. That’s why I believe stocks topped out last May and haven’t been able to overcome that top since. Lately, the picture is getting even uglier. The stock market has now established a “lower high” and is breaking a major trendline that’s held for almost five years. It likely won’t be long and we’ll see the market set its next “lower low” as it heads back toward its 200-week moving average. It could fall even further than that. Additional bearish signals are flashing. 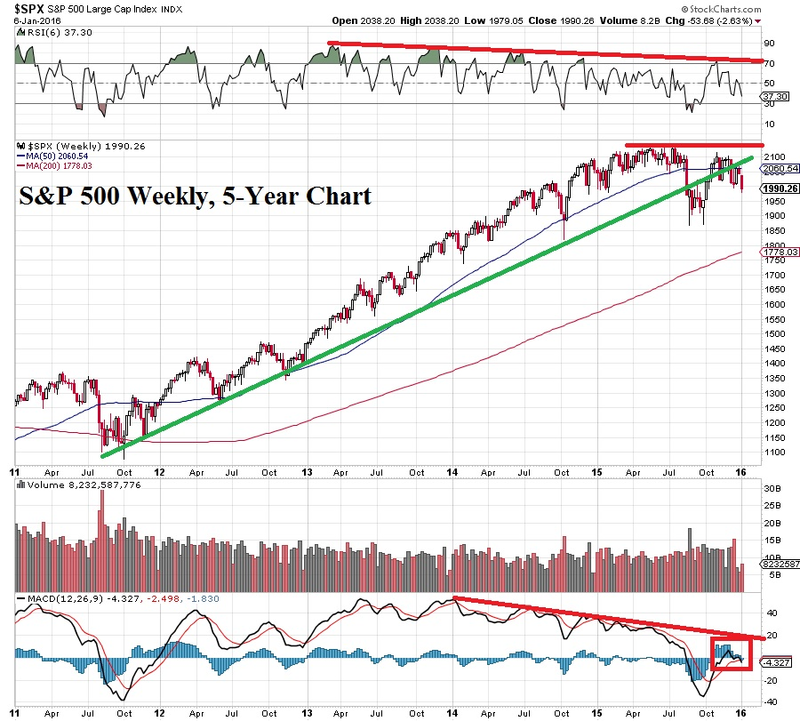 The S&P 500 continues to trade below its 50-week moving average as the moving average begins to turn slightly lower. Additionally, the relative strength index (RSI, noted at the top of the chart) continues to show weakness by slumping. This shows that the upward momentum is slowing, and now I believe it’s going to cause stocks to stall out. The moving average convergence divergence (MACD, at the bottom of the chart) shows a similar picture. It’s been warning of this moment for two years now, and it’s finally here. Additionally, the MACD just provided another sell signal and it’s below its zero line, which is even more bearish for the stock market. The dollar is troubled as well. Yes, 2014 was a heck of a year for the greenback — it soared. However, so far that rally stalled out as of last March. And even when it retested its highs back in December, it halted right at that same level once again. At this moment, you’d think the dollar would be powering ahead. After all, the Federal Reserve governors have been out in force giving speeches about rate hikes coming. In fact, some of them have talked about three to four rate hikes in 2016 (which I don’t personally believe will happen). Nonetheless, this would normally be bullish for the dollar. You’d see it rallying in a U.S. hiking mode while most of the rest of the world continues to keep rates extremely low. Yet, what has happened as all of this has unfolded? The dollar has actually declined and the euro (which is also known as the anti-dollar) has rallied. The euro vs. the dollar currency pair (EUR/USD) shot up from around 1.04 to 1.08 and held those gains even after the U.S. hiked rates and talked of further potential raises. In any sane market, that news would boost the dollar and take the euro lower. EUR/USD theoretically should be making new lows below 1.04 — but it’s not! And when any asset should do something but fails, it shows that the most bullish scenario may already be factored in. In other words, the hikes are baked into level of the dollar right now. I said this in December, but I don’t think I had many believers at the time. I was basing my outlook on how the euro and dollar were acting, while skeptics were thinking of how they should be acting. In this case, there was a big difference between the two. Not only is the stock market in danger of a harsh selloff — going back to the current S&P 500 P/E, it’s interesting to note that major corrections and crashes tend to occur when that P/E is in the 20-25 range — but as confidence wanes in the U.S. stock market, that same negative sentiment could spill over onto the dollar and cause it to slump much further as well. I know this may sound crazy at this moment, but I believe that we could see EUR/USD go to 1.20 later this year and the U.S. Dollar Index drop from around 100 to the 85s. And if the stock market and dollar slump, what will be the beneficiary? Gold! In fact, as stocks tumble, economies slow down and energy prices remain low, tensions flare around the globe. Picture it this way: It’s like when you and your spouse are in a financial pinch. You’re much more likely to argue. Yet in times when there’s a nice financial buffer, you’re less likely to quarrel. So it is in the world. In times like these, you’ll see more verbal fighting between countries, while others will break out into war. You’ll encounter things like what we’re seeing now with North Korea supposedly testing a hydrogen bomb and the fighting between Saudi Arabia and Iran. As such events occur, that too will be good for gold. It’s for every one of these reasons that I believe it’s time to buy gold. We’ll do so via the SPDR Gold Trust ETF (GLD). 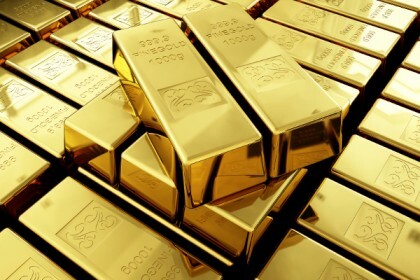 It’s the exchange traded fund that tracks gold’s price, so a stock investor can benefit from gold’s moves right through their stock brokerage account. In addition to all the reasons to buy gold now, I’m also seeing GLD technically improve on its chart while many other asset classes of the world are deteriorating technically. For instance, notice the strengthening in the RSI and MACD in the chart below. GLD has now made a recent “higher high” and jumped up above its 50-day moving average, which are both bullish signs. And GLD is at such a suppressed level price-wise that we can see a huge return without it even shifting back into a long-term uptrend, although I do believe such an uptrend is possible. I think we could easily see GLD reach $131 over the next year, which would be a 23.6 percent gain from here (and remember, that’s without gold even technically returning to its long-term uptrend). 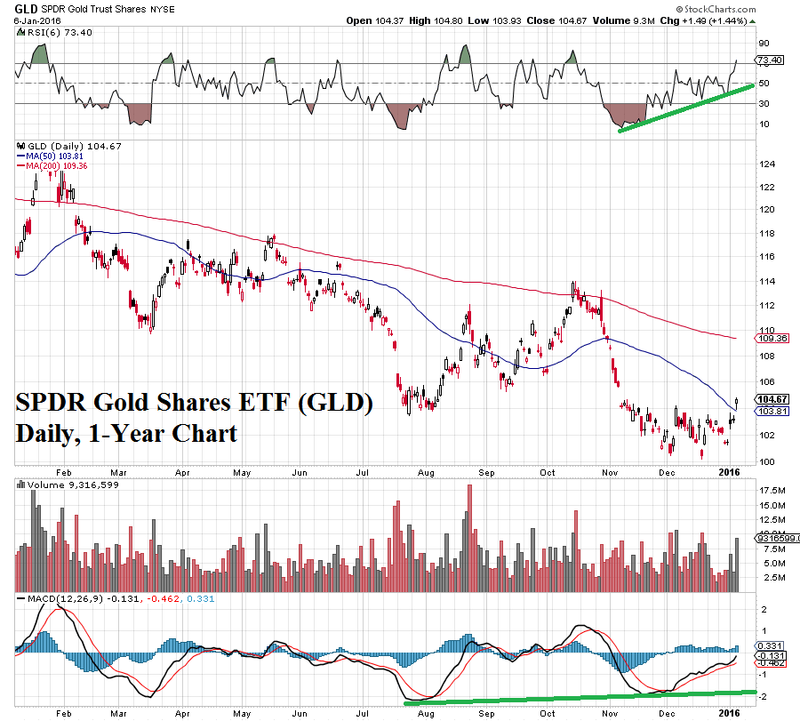 You can start buying the SPDR Gold Trust Shares ETF (GLD), at or below $108 per share. Alternative, buy at least 6 months ATM contract and sell Weekly 3 strike price to reduce your holding cost.